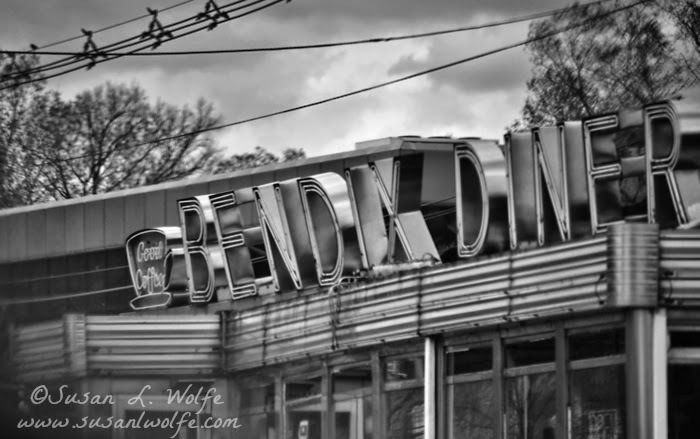 Built in 1947, the Bendix Diner is one of the last of the old school eateries in New Jersey. May it enjoy its reign at least until 2047, before the inevitable urge to upgrade its Art Deco design into yet another strangely ostentatious palace of sterile stone and grand staircases. This shot is for the lovely Lynne of Cafe Lynnylu who is hosting Black and White Wednesday #126, the weekly culinary gallery of monochrome photography presided over by charming Cinzia of Cindystar. Participation and/or hosting BWW are very easy and do not require a great deal of time investment. If you've got the shot, Cinzia has the venue. All details are a click away at the link above.